Last week we considered how “Our Father, who art in heaven” is a reminder of our Baptismal dignity. Baptism makes us children of the heavenly father. But Baptism, like childhood, is only potential, looking forward with promise. That promise looks forward, above all, to praise. We are given divine birth so that we can know the divine. We become “sons in the Son” so that, like the Son, we can become eternal praise of the Father. 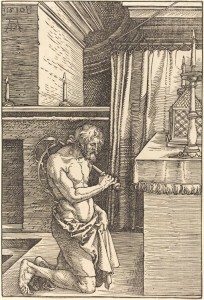 We can enter more deeply into this next line of the prayer by picturing a priest at the altar. He lifts up his hands in praise, he hallows God’s name. Indeed, Baptism is the door into the Church – so that we can attend the perfect praise of the Mass. We dip our fingers in baptismal water at the door, and go up to the altar; our Baptism gives us access to the place of the Priest; calling God our Father opens up the possibility of hallowing his name. Now, in Catholic theology there are two kinds of priesthood. 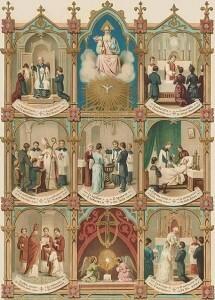 Baptism itself makes us priests: “Having been drawn to Him, a living Stone, indeed rejected by men, but elect, precious with God; you also as living stones are bulit up a spiritual house, a holy priesthod, to offer up spiritual sacrifices acceptable to God through Jesus Christ. . . . You are a chosen generation, a royal priesthood, a holy nation, a people for possession, so that you might speak of the praises of Him who has called you out of darkness into His marvelous light” (I Peter 2:4-5, 9). We are all stones building up the Church, all priests, all people of praise. And so the proper name for what we typically call the sacramental priesthood is really Holy Orders. Orders means hierarchy, leadership. It is not that the sacramental priests are the only priests – it is that they lead the priestly people in the priestly service of worship. If we are a priestly people, why do we need priestly “orders”? Imagining the ordained priest when we pray “Hallowed be thy name” can help us understand. Yes, my life is called to be praise. I am called to hallow God’s name. But I need an image of that hallowing. I can think of myself at Mass best by drawing to mind the one who leads me in worship. The sacramental order is all about making things vivid – giving us, fleshly people, clear images of the truths of our faith. We are not left to understand vaguely that we have been born again to a new Father – we see it happen, in Baptism. We understand that all of life is praise when we have special moments of praise, with special leaders in praise. The ordained priest is, first of all, a sacramental image of our praise. He manifests in his body this truth of our faith. He is also a sacramental image that praise is a gift. I do not make myself a Son of God, I receive it – it is poured onto me in Baptism through the ministry of the Church, the Body of Christ. I do not rise up to God in praise by my own strength, but that too is a gift. The ordained priesthood is a gift to us, something that we cannot make ourselves. We cannot ordain priests except through the hand of the ordained, reaching back to Jesus and the Apostles. And we cannot offer perfect praise except through that sacramentally ordained ministry. The point is not that priests are better Christians. The point is that the priesthood itself – all of our priestly service – is a gift from God. 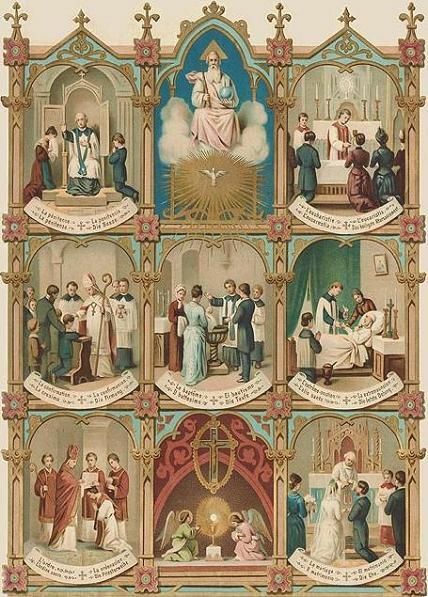 The sacramental priesthood is an icon showing that worship is a gift. We further remind ourselves of that gift by invoking the word “name.” We only know God’s name because he has told us. Again, there is an icon of this truth in the Magisterium of the Church: God speaks to us from outside of us, through Scripture, interpreted by the Tradition, interpreted by the ordained leaders of the Church. To know God is all gift. Finally, it is a gift that draws us together, not dispersed to our private rooms, but gathered around the altar of praise – gathered around the ordained priest, who leads us in procession. When we pray “hallowed be thy name,” even in our private rooms, we call to mind the ordained priest and understand how all of life is drawn to the altar of praise. How would it change your day if you saw it pointing to the altar? When I was first learning about the Catholic Church I was taught about three kinds of prayer: vocal prayer, mental prayer, and contemplative prayer. Whether or not you have learned these particular names, I think they name ideas that most Catholics today have about prayer. And I think those ideas are very wrong. I hope I don’t take too strong a stance here, but I’ll try to explain. Vocal prayer is prayer with your voice. Mental prayer is prayer with your mind. Contemplative prayer is some sort of mystical prayer of union. Those definitions I think are correct. What is incorrect is that we tend to think of these as things we do at different times. So someone who prays the Liturgy of the Hours might think that saying those words is vocal prayer. But then he needs to set aside some time for mental prayer, by which he means some sort of spiritual exercise, probably using the imagination. And then if he’s really serious, he’ll set aside some more time for contemplation. I was taught about “the prayer of silence,” where you just sit and do nothing, and that’s contemplation. Many serious Catholics today think this is how the life of prayer works. I think they are missing the Catholic tradition’s deepest insights about prayer. To the contrary, I think if you read the doctors of the Church and understand the traditional ways of prayer, these three things are supposed to happen at the same time. 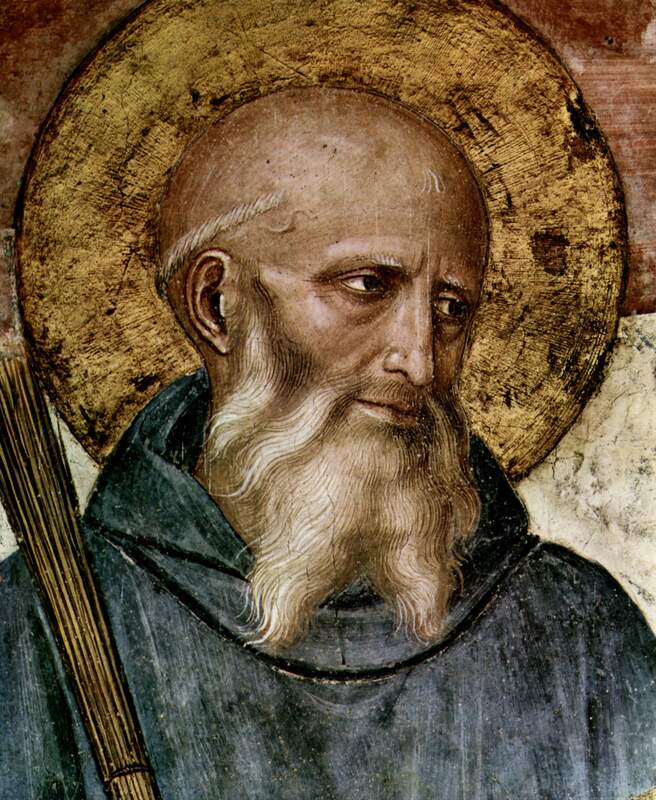 St. Benedict’s adage is, “let your mind be in harmony with your voice.” Mental prayer means that as you say your vocal prayers – the Liturgy of the Hours, the rosary, the Our Father, the Mass, whatever – you actually think about what you’re saying. Not about something else, but about what you’re saying. The words are there for a reason. We don’t say all those Hail Mary’s, or all the prayers of the Mass, or the Psalms, so that we can ignore them. I call this “verbal prayer.” Words are something we say with our voice – and understand with our mind. Mooing or screaming are “vocal” activities that are not words – but the Church teaches us to pray with words, which engage our mind. 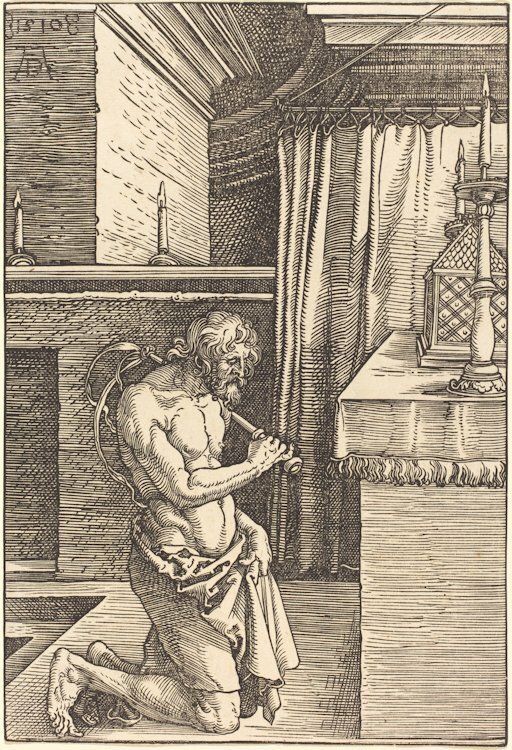 Groaning is not the traditional Catholic way to pray. Contemplation, it seems, is something that happens now and then while we are doing verbal prayer. Now and then we catch glimpses, we feel stabs of love. That’s something that happens while we are saying our vocal prayers with our minds attuned to our voices. Teresa of Avila is insistent that contemplation is always a gift, “infused” not “acquired.” What she means, I think, is that it is foolish to set aside time for contemplation. Contemplation is something divine that happens while we are doing human kinds of prayer – verbal prayer. She insists that we focus on the humanity of Christ. I think what she means – please, read her at greater length – is that we have to pray in human ways. Humans use words. The Psalms are the divine made human. The Gospels are the divine made human. Jesus is the divine made human. When we separate contemplation from vocal and mental prayer, we separate the divine from the human. The whole point of Jesus – and of the Bible and the sacraments – is that we can come to God through human things. Do not separate the humanity from the divinity! And she insists that she never prays without a book. That’s Teresa – but it’s even more in the rest of the tradition. Catholic prayer is verbal prayer. Finally, prayer is not merely an act of will. The verbal prayer I am describing passes through our understanding: we catch contemplative glimpses when we understand the words that we say. To make prayer into merely an act of will is to separate our intellect from our will. Christ does not carve up the human person. Our will and intellect are engaged together. We pray with our will by also praying with our intellect – and vice versa. And to make prayer into merely an act of will is to separate humanity from divinity. At its root – historically, philosophically, and theologically – the idea that prayer is merely effort is really the idea that we encounter God by leaving our humanity behind, by leaving our understanding and our affections and just pushing. That might sound very heroic, but it is not the Catholic tradition. Human prayer – the prayer the saints describe – is humble; we attain God through the humanity of Christ, we do not leap into the heavens. 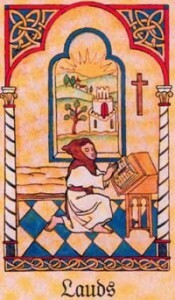 The Catholic tradition does lectio divina: reading and understanding and so contemplating. The Catholic tradition does liturgy: the most sublime prayer is prayer using words – words that we can understand. It is valuable – don’t get me wrong – to set aside time for silence and for various spiritual exercises. But these are not the highest forms of prayer – they are only preparations to pray better with words. Where do words fit in your prayer life? There is a tradition of praying for the virtues with the Rosary. It makes sense: what we should pray for more than anything is personal transformation. Sometimes people have a virtue for each mystery, like poverty for the Nativity. Or you could make the first three Hail Mary’s be faith, hope, and charity, and the next seven be the Beatitudes or the Gifts of the Spirit. There is also a tradition – John Paul mentions it, and Louis de Montfort makes it almost normative – of naming the virtue or the mystery, or both, within the Hail Mary. This is a way of focusing ourselves on the words of the Hail Mary. The Hail Mary isn’t there just as a timer – it’s not replaceable with the ABCs. It’s there so we can pray it. Hail Mary – of charity (or whatever virtue). First we say, “look at Mary.” Now, the point of everything – in Christianity, in the rosary, in Marian devotion – is that Christ is the source of all that is good. Mary is not good by herself, Jesus makes her good. But see how important it is to begin by looking at Mary. If we turn it around, and say, “the Lord is with you – and you have charity,” the danger is that we can think she, and we, don’t really have charity, it’s really just him nearby. The point of the Lord’s gift, of grace – and the point of Marian devotion – is that when Christ gives the grace, we really do receive it. Mary really is charitable, Our Lady of Charity. First we look at her: see Mary, full of charity. Full of grace. Ah, everything about her is a gift from God. This happiness of Mary, this virtue of Mary: it is grace. The Lord is with you – at the Baptism in the Jordan (or whatever mystery). The mysteries make vivid a key point about grace and Christian virtue: it is given to us through the Incarnation of Christ, to unite us to himself. So we think not just vaguely and generally about the Lord’s presence: we think of him in a particular mystery. And we see, as it were, the virtue (charity, or whichever) drawing Mary to him. In every situation, he gives us the grace to live virtue there. Blessed art thou among women. Now we look around. What distinguishes Mary? What makes her different from all the other women, all others “like” her? It is the virtue that Christ gives her. Here, at the Jordan river (or at the Crowning with Thorns, or wherever), there are many women: and what makes Mary stand out is her charity (or poverty of spirit, or wisdom, or whatever). Virtue is what sets her apart. And blessed is the fruit of thy womb. We named Jesus “Lord”; now we name him “the fruit of your womb.” In the first, we speak of his divinity – radiating grace, and drawing her to him. Now we think of his humanity: he too has these virtues, though in a special way. See him there, in that mystery, with his own super-abundant meekness, or hope, or fortitude. Jesus. Jesus means savior. He is savior because in his blessed humanity he has the virtues that our humanity needs. His divinity fills his humanity with exactly what we need to be united to him: grace, and love in general, but also all the specific virtues we pray for. He is savior because he carries the “blessing” that we need. Holy Mary. Now we turn to the petition. First we point out whom we are addressing. It is as if we say, “virtuous Mary”: what am I going to ask of the virtuous one, but virtue? “Dear Mary, who are poor in spirit, please give me a car?” No. But instead of virtuous, we say “holy”: Christian virtue, the virtue that unites to Christ. That’s the person we are addressing, that’s what we are talking about. Mother of God. We invoke her authority. It is an authority of grace. It’s not that God “has to” listen to her. It’s better than that: God chooses to listen to her. He made himself her child, chose to be obedient to her. 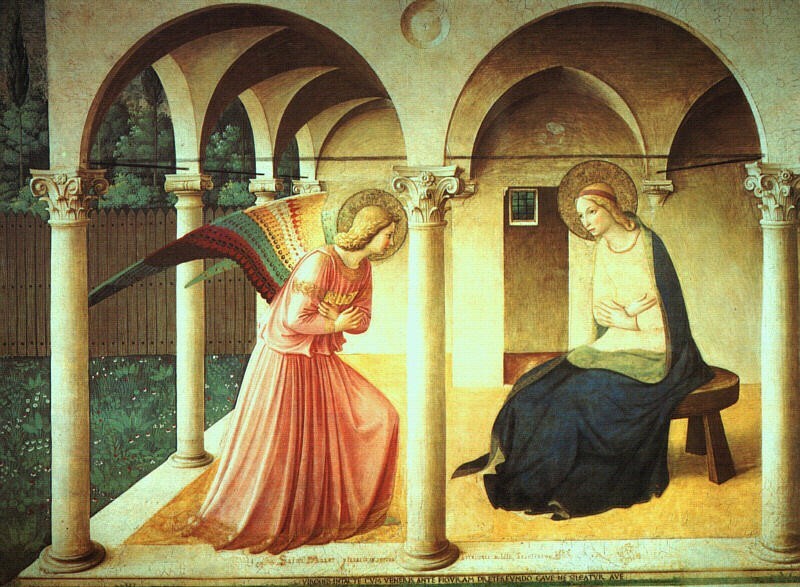 Really, we invoke the whole mystery of the Incarnation: God has chosen to come close to us, and it is in this mystery – a mystery summed up in the womb of Mary – that we beg for grace. Pray for us sinners. Ask for us what we need. And what do we need? Not to be sinners. To be holy (like Mary). Christian virtue. Naming ourselves as sinners also names the reason for God’s grace: not because we are good, but because he is. Many of our intercessions point this out: for the sake of your name, though I am miserable. I am not demanding, I am asking, as a beggar – and in the order of virtue, the name for a beggar is sinner. Now and at the hour of our death. We have seen in what situations Mary received the grace of the virtues. In what situations do I need it? I need it now. And always I consider that I will need it in the final test, in the final moment, at the hour of my death. How do you use the Hail Mary? For prayer to develop this power of purification, it must on the one hand be something very personal, an encounter between my intimate self and God, the living God. On the other hand it must be constantly guided and enlightened by the great prayers of the Church and of the saints, by liturgical prayer, in which the Lord teaches us again and again how to pray properly. Cardinal Nguyen Van Thuan, in his book of spiritual exercises, tells us that during his life there were long periods when he was unable to pray and that he would hold fast to the texts of the Church’s prayer: the Our Father, the Hail Mary and the prayers of the liturgy. Praying must always involve this intermingling of public and personal prayer. This is how we can speak to God and how God speaks to us. In this way we undergo those purifications by which we become open to God and are prepared for the service of our fellow human beings. We become capable of the great hope, and thus we become ministers of hope for others. Hope in a Christian sense is always hope for others as well. It is an active hope, in which we struggle to prevent things moving towards the “perverse end”. It is an active hope also in the sense that we keep the world open to God. Only in this way does it continue to be a truly human hope. “Saint Augustine, in a homily on the First Letter of John, describes very beautifully the intimate relationship between prayer and hope. He defines prayer as an exercise of desire. Man was created for greatness—for God himself; he was created to be filled by God. But his heart is too small for the greatness to which it is destined. It must be stretched. “By delaying [his gift], God strengthens our desire; through desire he enlarges our soul and by expanding it he increases its capacity [for receiving him]”. Augustine refers to Saint Paul, who speaks of himself as straining forward to the things that are to come (cf. Phil 3:13). He then uses a very beautiful image to describe this process of enlargement and preparation of the human heart. “Suppose that God wishes to fill you with honey [a symbol of God’s tenderness and goodness]; but if you are full of vinegar, where will you put the honey?” The vessel, that is your heart, must first be enlarged and then cleansed, freed from the vinegar and its taste. This requires hard work and is painful, but in this way alone do we become suited to that for which we are destined.